Port Macquarie attracts tens of thousands of tourists every year but today it had a visitor of a different kind. A fur seal blending in with rocks at Lighthouse Beach while soaking up the sun and delighting crowds as they walked by. 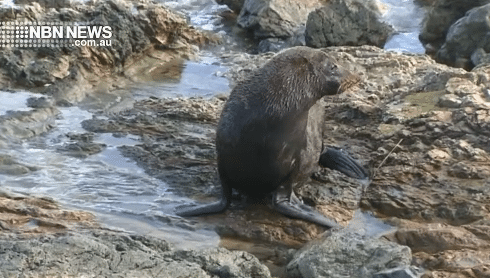 After being splashed by water one too many times, the marine mammal gave its seal of approval to a drier location..
It’s the second time a fur seal has been spotted at Lighthouse and we’re warned to keep a safe distance of at least 40 metres.